วันขึ้นปีใหม่ / wan kʉ̂n bpii mài / is celebrated on the 1st January every year, and marks the start of the year in the Gregorian calendar. This holiday is recognized in many countries. New Year is always a big festival. With many foreign tourists who visit Thailand at this time of year and the large expat community, the celebration is recognised by all. This national holiday is also needed to recover from the party the night before. วันมาฆบูชา / wan maa-ká-buu-chaa / is an important Buddhist celebration which reminds followers to practice good deeds and avoid sin. 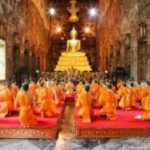 It honours the occasion when Buddha delivered his principles and teachings to 1250 assembled monks, which coincided with a full moon. Thais congregate at temples to light candles and take part in various religious processions. วันจักรี / wan jàg-grii / commemorates the foundation of the current Chakri Dynasty in 1782. The present monarch is the ninth King (Rama IX) in the lineage. Chakri Day has great significance, as Thais hold the monarchy in very high regard. The King and other members of the Royal Family hold ceremonies to honour previous monarchs, and Thai people take part in similar events around the country. วันสงกรานต์ / wan sǒng-graan / is a major holiday and festival in Thailand to usher in the Thai New Year. All generations take to the streets to enjoy large scale water fights with buckets, hosepipes and giant water pistols. Pickup trucks loaded with revellers and water barrels drive around soaking anyone they can. Faces are daubed with scented talcum powder, and foreigners, in particular, should expect to be targeted. The celebrations normally last for three days but can extend to six days in cities such as Chiang Mai. As well as being hugely enjoyable, it’s also traditionally, a time to visit relatives and pay respect to one’s elders. Many Thais visit a local temple to pray and give alms to the monks. During Songkran alcohol consumption is high and consequently road accidents greatly increase, so be especially careful on Thailand’s roads at this time. วันแรงงาน / wan rɛɛng-ngaan / is a public holiday in many countries worldwide. It is the importance and contribution of Thailand’s unsung workers. It’s taken as a holiday by the private sector, and most banks are also closed. วันฉัตรมงคล / wan chàt mong-kon / is a public holiday in Thailand to commemorate the anniversary of the coronation of His Majesty King Bhumibol Adulyadej as Rama IX, the ninth King of the Chakri dynasty. People in Thailand celebrate Coronation Day on 5th May every year. King Rama IX was crowned King on the 5th May 1950. He is the world’s longest-serving monarch. วันพืชมงคล / wan pʉ̂ʉt-mong-kon / is the day that marks the official start of the rice growing season. This ceremony is held at the Sanam Luang (Royal Field) in front of the Grand Palace in Bangkok. Originating over 700 years ago, predictions are made about the quality of the coming year’s harvest. Rice seeds are blessed and at the end of the festival, crowds run into the field to get the seeds, which are considered lucky. Farmer’s Day is observed on the same date. วันวิสาขบูชา / wan wí-sǎa-kà-buu-chaa / is an important religious event to celebrate the birth, enlightenment and death of Buddha. Most Thais, visit a local temple to make merit (giving alms to monks and praying) which can get very busy, especially in the evening when candlelit processions take place in the temple grounds. 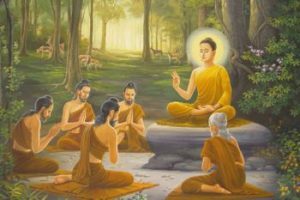 วันอาสาฬหบูชา / wan aa-sǎan-hà-buu-chaa/ is a religious festival celebrating the occasion when Buddha delivered his first sermon (the Dhammacakkappavattana Sutta) after enlightenment. This celebration occurs one day before the Buddhist Lent. Just as with other Buddhist festivals, many Thais visit their local temples to make merit and join in religious processions. วันเข้าพรรษา / wan kâo pan-sǎa / is the first day of a three-month religious period during the rainy season known as Phansa, Rains Retreat, or more informally Buddhist Lent, which is practised by Theravada Buddhists. During this period, monks are supposed to stay in the temple grounds and avoid travelling around the country. The original purpose was that monks would not damage crops during their journeys. Some strong-willed Thais try to give up meat, alcohol and other vices during this period. วันแม่ / wan mɛ̂ɛ hɛ̀ng-châat / is her Majesty Queen Sirikit’s birthday. This is a very special occasion celebrated by Thais everywhere, especially around the Grand Palace in Bangkok where devoted admirers setup coloured lights, and bring portraits and flowers. Quite appropriately, this day is also Mother’s Day in Thailand. วันปิยะมหาราช / wan bpì-yá-má-hǎa râat / is the Rama V Day, and this date commemorates the death of King Chulalongkorn in 1910, who is credited as modernizing and reforming Thai society and ensuring that Thailand was never colonized by foreign nations. Known as the Great Beloved King, he passed laws to abolish slavery completely in 1905. วันพ่อ / wan pɔ̂ɔ hɛ̀ng châat / is the birthday of the current King, His Majesty the King Bhumibol Adulyadej or the King Rama IX of Chakri Dynasty. It is also considered as Father’s Day of the nation. It’s an auspicious day since the King is venerated as the father of the nation from all of Thai people and also many people around the world. The King is the best role-modelled father, for the father of the nation as well as of his royal family. As the father of the nation, generosity and compassion are boundless, just attempting to keep us happy. วันรัฐธรรมนูญ / wan rát-tà-tam-má-nuun / which was created in 1932 to mark the transition from absolute monarchy to a democracy. Since 1932, Thailand has had seventeen charters and constitutions in place, an unavoidable result of frequent political instability. วันสิ้นปี / wan sîn bpii / New Year’s Eve is one of the largest global celebrations around the world because it marks the last day of the year in the Gregorian calendar, December 31. Many people celebrate the end of the year with mixed emotions; joy, reflection and while anticipating for the New Year. This public holiday is enjoyed with much commotion by many Thais and foreigners. At popular tourist destinations, there are always massive street celebrations, especially around the bars. The parties, fireworks and feasts continue late into the night.